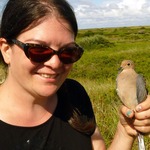 From her very first taste of bird research on Monomoy in 2013, Val has been hooked! As a volunteer assistant on most MOBO projects, she developed strong bird handling skills and provided technical assistance in the field, while also growing the outreach and online components of the project. She is currently working on a long-term study of the Pine Warblers that breed in the forest of Wellfleet Bay Wildlife Sanctuary.